Do a Wrist Stretch Daily! Sit up tall with your shoulders down and back. 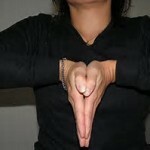 Place both hands together with your fingers pointing toward the floor. Gently press your palms together. Hold for 10-30 seconds, then release. Tight shoulders from sitting at your desk? Do this stretch every few hours. Reach your right arm straight up overhead. Keeping your torso upright, bend your right elbow and reach your right hand toward your upper back. Hold for 10-30 seconds, or 3 deep breaths. Release. Repeat reach your left arm straight up overhead. Front Shoulder and Chest Posture Stretch! Stretch Break: Stand up. Place both hands behind your head. Pull your shoulders down and back. Next, pull your elbows wide. Hold for 10-30 seconds. Now set your phone alarm to signal in 2 hours for your next Stretch Break! At your desk posture stretch! Sit forward in your chair with both feet flat. Inhale and reach both arms straight up overhead. Lace your fingers with your palms facing down. Exhale, lean to your right. Inhale, return to the center. Exhale, lean to your left. Inhale, return to the center. Exhale, lower your arms. Repeat 2-3 times. Stretching reduces muscle tension, and the deep breathing reduces stress. Perform this stretch a few times each day for physical and mental benefits! Ease your sore muscles from sitting all day with this Bend-Forward stretch. Here’s how to do it: Sit forward in your chair with your feet hip-width apart and flat on the floor. Place a rolled up towel or coat on your lap to act as a buffer from bending too far forward. Tuck your chin to your chest. Inhale and place your hands on your thighs. Exhale and walk your hands down your legs until you feel a gentle stretch. Inhale again. Exhale and slowly return to your seated upright position. *Always consult your physician before performing exercise. Stand up behind your chair. Hold on to the chair for support with your left hand. Bend your right knee and hold your right ankle behind your body with your right hand. Keep your torso upright. Hold for 10-30 seconds, then slowly release. Repeat the same stretch, holding on to the chair with your right hand. Bend your left knee and hold your left ankle with your left hand. Stand up tall and breathe, hold for 10-30 seconds, slowly release. Unfortunately sore, tired, painful muscles and joints are a regular and ongoing challenge for those who work in front of a computer. However, there is help! Welcome to the world of ergonomics. 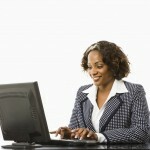 Ergonomics involve fitting a worker to his/her work space. 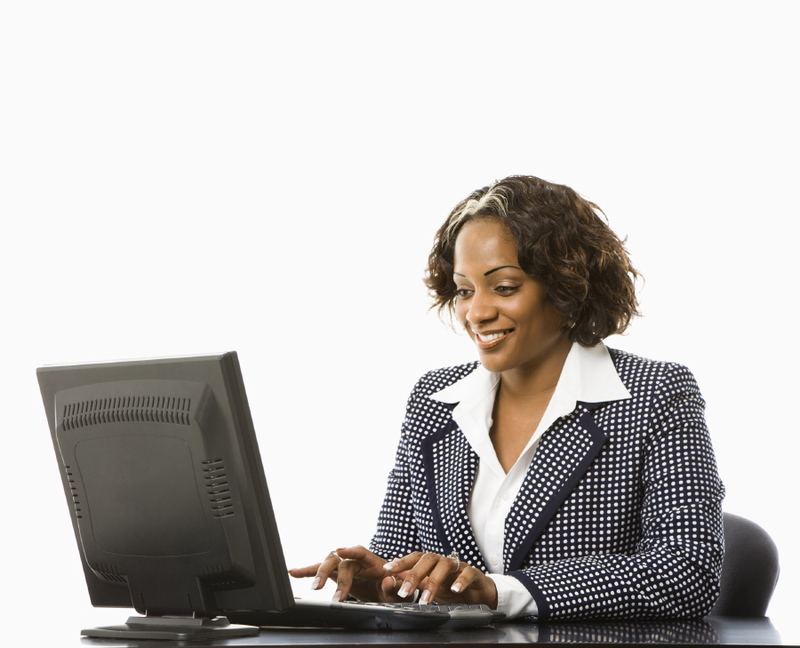 An ergonomic evaluation will review posture, reach and focal points, including such angles as seat height, monitor position and keyboard placement just to name a few. A proper fit prevents many of the overuse conditions we may experience, such as cumulative trauma disorders, repetitive stress injuries and repetitive motion injuries. We know of these conditions as tendonitis, sprains, strains, carpel tunnel syndrome, neck/back pain, and bursitis. Reach up and over stretch. Reach both arms straight up overhead. Lean to your right, then your left. Wrist circles. Circle your wrists 5 times one direction, then 5 times the opposite direction. Extend fingers stretch. 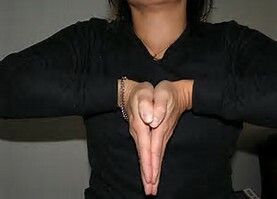 Make a fist, then extend and straighten your fingers. Hands behind body with chin to chest stretch. Lace your fingers behind your body. Keeping your torso upright, extend your arms, and press your hands down toward the floor. At the same time lower your chin toward your chest. Arms out to sides stretch. Extend both arms straight out the sides of your body. Keeping your arms parallel to the floor and your palms facing forward, pinch your shoulder blades together and pull your arms back. Hands behind head stretch. Lace your fingers and place your hands on the back of your neck. Keeping your hands in place and your torso upright, pinch your shoulder blades together and pull your elbows wide. Palm down and in stretch. Extend your right arm in front of your body with your palm facing the floor. Curl your fingers in while bending your wrist down and in. Repeat with your left arm forward. Arms overhead with look up stretch. Lace your fingers and reach both arms up overhead until your elbows are straight. Look up to the ceiling. Investing in a professional ergonomics evaluation, taking breaks and doing a few stretches or range of motion exercises during the day will help reduce common overuse injuries we find in the workplace. You’ll also improve work efficiency as well as comfort during your day.